Koh Kraden is a small island to the southeast of the southern tip of Koh Lanta. A Japanese destroyer sunk just off the coast in 1944 following an air raid. She now lies broken in two below a thermocline in around 25 meters of water. Visibility is dramatically reduced below this thermocline at 15 meters or so and the wreck is still draped with fishing nets so a dive light and knife are essential. 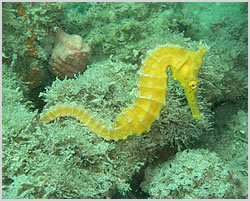 Seahorses are often spotted hiding in crevaces along the wreck.